Dismay is an understatement at the faux outrage generated by the BBC story about Tring School requiring parents’ buy for ChromeBooks. I saw the story from a Twitter post from Tom Bennett, someone I really admire in the education ecosystem. Tom’s line is that that Tring’s plan was, ’clearly discriminatory’, and with over 30,000 followers his voice is an influential one. From the BBC story my interpretation of the situation is rather different. the two versions of ChromeBooks for students are £149 or £185 or 78p or 97p per day (a school ‘year’ is about 190 days in England). Students from disadvantaged background can also get a ChromeBook for £20 or 10p per day. As a rudimentary benchmark for what this equates to is that Tesco’s price for a single banana is 12p today. My view is that Tring Headteacher, Sue Collins, has made a smart pragmatic decision. She could have cut art, sport and loads of other things; instead she has come up with a scheme that will allow all students to have relevant, affordable access devices. I wonder what the response would have been if she had said the school was ditching all classroom IT for pen and paper? Aside from the fact it would be kyboshed by the DfE and gained immediate OFSTED censure, the cost to the parents of disadvantaged students would certainly be more than £20 per year. The real money issue that’s missed in the story is the unsexy, but crucial issue of Total Cost of Ownership. The initial cost of any device (ChromeBook, Windows, Apple etc) is only a fraction of the real TCO. Real TCO is calculated over the life of the devices (at least 3 years) and also include the costs of hardware maintenance, IT software and infrastructure, management, admin and end-user costs. These normally run to as much as 3-6 times the initial device cost. Calculating TCO accurately isn’t easy, but my very rough calculation is that Tring could save at least £1,000,000 over 3 years with ChromeBooks compared to the lowest cost Windows device, and even more compared to any Apple. Yes, I know many basic Windows and Apple devices are more ‘powerful’ but that’s an outdated argument as we live in a tech world (inc. in education) where access trumps horsepower everyday. So in terms of social equity and educational outcomes (the later not mention in either the BBC story or Tom’s tweet) Ms Collins has made the right decision for her school, her students and their families. 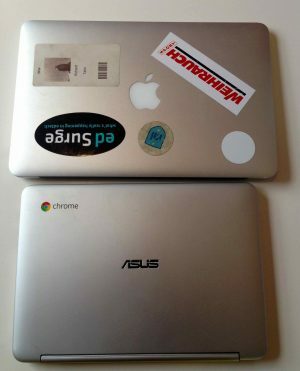 Disclaimer – I have a ChromeBook and a MacBook Air, a Mac Mini and 3 iPhones but have never had any commercial relationship with nor taken any form of remuneration from Apple, Google or Microsoft. I did once speak on a Dell panel at SXSWedu, but paid and the trip myself.